Description: Only the main roads appear on this map, giving the appearance of a rather spacious capital city. The new London Bridge is shown without its approaches. Pecked lines show the intended location of the Thames Tunnel. Marc Brunel, father of the great engineer Isobard, solved the problem of how to bore through soft ground or under water, inventing the tunnelling shield. Both father and son worked on the tunnel which was completed as a foot tunnel in 1843, before becoming a railway tunnel for the East London Railway in the 1860s. 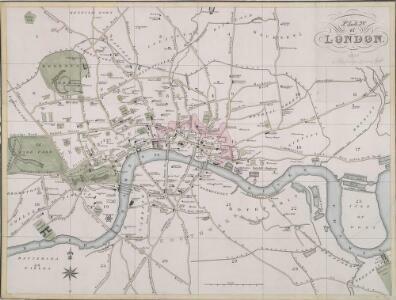 The East and West India Docks are also shown.